Eric Knopf (31) and friend Michael Mueller (26) began Armed With Truth about two years ago. The idea came from a conversation that the two were having about Scripture and how much it had changed their lives. So, Eric began laminating Scriptures to attach to his surfboard, so that he could memorize them while waiting for wave sets. It didn't take long to realize that this was ensconcing the two and others in a positive and loving atmosphere. As this was going on, others were asking if they could receive such products. 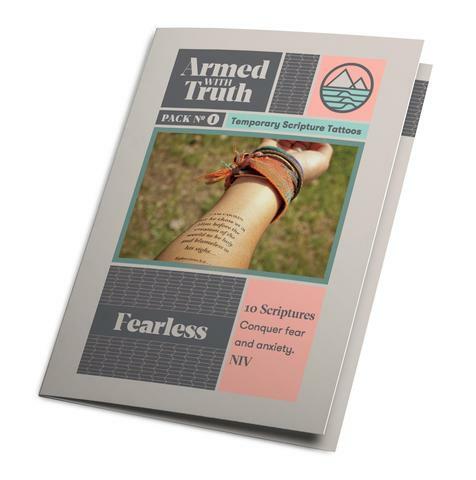 Now, Armed With Truth has over 100 different verses in 12 themed packs, plus design works that the owners are proud of. Their final word is that the two do suffer some flack from the Christian community, as they are against the tattoos. (Your writer - sighing.) It made the men think about what they were doing. They decided that they were doing the right thing. Personally, we support them. Our only lament is that we didn't receive more than one of the twelve packets. Our sibling is new to teaching a Bible class at her church and we would have loved to have had more of these to pass on to her. Well, the ones which we will not personally be wearing. Upon asking about this, Mueller was quite eager to send out more packs. "No." We emphatically stated and we were humbled by his great attitude. We completely support their business endeavors and wish them all of the luck and all the prayers in the world, not just to stay in business, but to grow, to evolve and to stay strong with their personal convictions.